I'd all but forgotten about this old recipe until it was shared by Doug on our Facebook recipe page more than three years ago. I've been working on my version of it since then, and have made this multiple times, before finally settling on this combination of ingredients and method. Most of these casseroles don't include much in the way of sauce or seasonings, but I felt it too dry and in need of a boost of flavor, so I've added extra sauce and a few of my classic spaghetti and lasagna seasonings to my version. 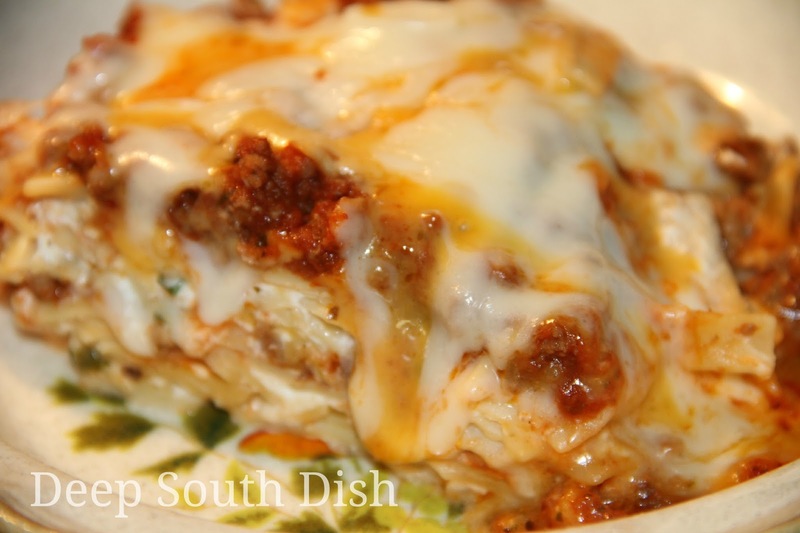 Most recipes put the dry noodles on the bottom, then add a layer of the cheese mixture and all of the meat on top. You'll find that most other recipes are also very heavy in cream cheese - as much as a full 8-ounce block. I adore cream cheese, but it was just too much for me, so I went with a small amount, only 2 ounces, but also included both cottage cheese and sour cream. I also found that I liked it better with the cream cheese mixture tossed with the warm noodles, then layered in along with some shredded cheddar and mozzarella cheese, and the meat sauce in two layers and finished with more shredded cheese on top. It's my twist on this classic casserole. As always, the full recipe with measurements is further down the page, past the step-by-step photos. Here's how to make it. Preheat oven to 350 degrees F. Lightly butter a 2-1/2 quart baking dish. Cream together cream cheese, cottage cheese and sour cream until well blended. While we're at it... this casserole is much better with 4% cottage cheese and full fat cream cheese and sour cream. It just is. Yes, you can make it with reduced fat products and lean beef, and I've done them all, but honestly, you just can't beat the real thing. Just have a smaller portion and fill up on some side veggies or a salad. Stir in green onion and set aside. Prepare egg noodles to shortest time according to package directions, drain and stir sour cream and cheese mixture into noodles while still warm. Meanwhile, be browning the ground beef, draining off any excess fat. I recommend chuck for the flavor. Stir in pasta sauce, Worcestershire, hot sauce, Italian seasoning, basil, garlic powder, salt, pepper and Cajun seasoning. Let simmer on low for about 20 minutes. I just love this appliance and it gets used a lot in my kitchen. While I do use it for blending things, I think I use the food processor bowl more. I own a larger Kitchen Aid food processor, and while it is super handy for bigger jobs and I love it for that, the unit is heavy and awkward, and since I don't use it too often, it lives on a shelf in my walk-in pantry. The Ninja stays on the beverage and snack station in my breakfast nook all the time, making it much more handy to use. Since I buy most of my cheese in blocks and shred it myself, I find that the food processor attachment is super easy for when you need just a few cups of cheese. We're doing two layers, so add half of the noodle mixture to the bottom of the prepared casserole dish. Top with half of the meat mixture. Add half of the cheddar and mozzarella. Repeat layers. Bake uncovered at 350 degrees F for 35 to 40 minutes, or until bubbly and heated through. For more of my favorite casserole recipes, visit my page on Pinterest!! Preheat oven to 350 degrees F. Lightly butter a 2-1/2 quart baking dish. Cream together cream cheese, cottage cheese and sour cream until well blended. Stir in the green onion and set aside. Prepare egg noodles to shortest time according to package directions, drain and stir sour cream and cheese mixture into noodles while warm. Meanwhile, brown ground beef, draining off excess fat. Stir in the pasta sauce, Worcestershire, hot sauce, Italian seasoning, basil, garlic powder, salt, pepper and Cajun seasoning and let simmer on low for about 20 minutes. Add half of the noodle mixture to the bottom of the prepared casserole dish. Top with half of the meat mixture and half of the cheddar and mozzarella. Repeat layers. Bake uncovered at 350 degrees F for 35 to 40 minutes, or until bubbly and heated through in the middle. This looks awesome Mary and while I don't remember ever having it, I like your method of mixing the white stuff with the noodles. What pasta sauce did you use? I buy the canned Del Monte traditional sauce because it's cheap! :) I just doctor it up. It's usually found on the very bottom shelf way under all the expensive stuff! You can also use plain tomato sauce for this - that's the traditional ingredient - but I like the Del Monte. I've also used Hunts. I haven't used the Del Monte yet (because I've never seen it and the Hunts is always, .99 a can), but you are absolutely right. That "cheap" stuff is just as good as the over priced fancy brands when it comes to using canned/jarred sauce. When I don't have time to start from fresh tomatoes and am making my quickie s'ghetti sauce it's what I use. I'm sick and the girls are out of town......... I have everything I need except the cream cheese, sour cream, and cottage cheese are all lowfat and I'm to sick to go to the store. Should I try it anyway or just use the meat for the taco soup like I was planning and do this one another day when the girls can eat it? I know, why don't you make me a pan and drive it to me (it's only about 6-8 hours to Atlanta isn't it)? I'll send the dish back. The DM and Hunt's are both pretty close in flavor. I like using them because it's like a bumped up version of tomato sauce but still inexpensive! They make a very good quick spaghetti. I call mine a "semi-homemade" version. It's still good with the lower fat versions, just loses a bit of flavor as usual from the lack of the fat. You can remedy that somewhat with a little more seasoning. Hope you feel better soon! 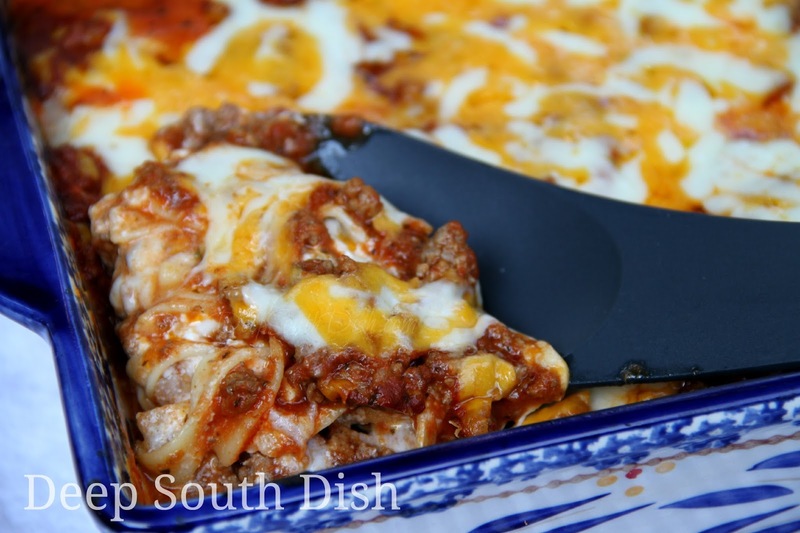 We absolutely LOVE Sour Cream Noodle Bake.... You have taken it to a whole new level here..... Putting this one on our menu!!!! LOL, you know me Brandi - always messin' with things!! That does sound divine. 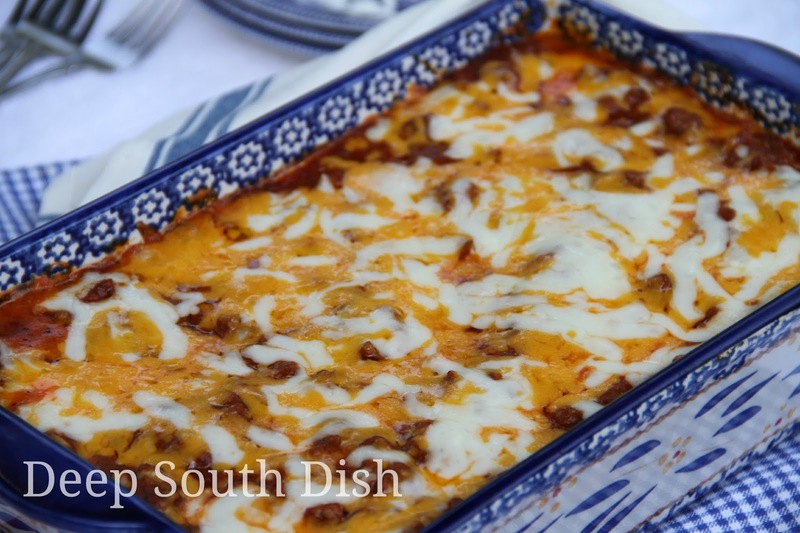 I'd like to make a version of it using Mexican crema instead of sour cream and go southwesthern. I have a Magic Bullet that we liked but then got the big Ninja that is blender sized. I like it but honestly we almost always use the small single sized cups on it instead of the big blender top. We might as well have gotten the regular small Ninja. We love this casserole! It's perfect for kids, at least my DGKs really like this. I noticed the first time I made this the regular way it seemed dry, so I added a can of petite diced tomatoes to the sauce. I also sauteed chopped onions and garlic with the meat. I layer mine like lasagna. The last time I made it, I added chili powder and cumin. Deelish! I'm doing that with the meat next time too Vicky! The green onion is good but I like onion & garlic in my meat also. I love this casserole! Thanks Mary! You're welcome Joanne - hope you enjoy my version of it too! Isn't that too funny?! That's what I find too - that it often picks up a new name from the person who makes it. I guess folks got bored with calling it "sour cream noodle casserole." No telling how many names there are out there! I keep seeing this recipe around, I'm going to have to try it. When I do, I will use your recipe. I have found that when I can find a recipe here for something, it turns out delicious! You're welcome - hope that you enjoy it Shirley! My mom made this family favorite when we were kids, but didn't have a name for it, so we called it "That Stuff!" It is still beloved by our entire family, but is a simpler version with just tomato sauce, no herbs, no mozzarella -just cheddar. I like to mix the cream cheese/sour cream/green onions and sometimes cottage cheese with the noodles also. This is called Green Onion Casserole in an old church cookbook that I have. So good! I can't even imagine how many names there must be for this one! My family doesn't like cottage cheese. What about ricotta? Have never heard of this particular casserole being made with ricotta, but I would think that it would work also. Let us know if you give it a spin! I've been making a variation of this old classic recipe for years. And as much as I like cottage cheese, I can't fathom using it in a hot dish. I know tons of people use it in their lasagna and those type of dishes and love it, but I can't mentally wrap my mind around it or force myself to try it. I always make this dish and sub out the cottage cheese with ricotta and it turns out fabulously. And one more name to the list, we call it Million Dollar Spaghetti. I have not personally, however I have heard that some folks have. Let us know if you give it a spin! Is this just 2 "ounces" of cream cheese or two 8 ounces of cream cheese? It does not seem like enough. Yes, it's just 2 ounces of the cream cheese - you'll see the markings on the foil. Remember you're mixing that with cottage cheese & sour cream! You're welcome Marie - I'm so glad that you enjoyed it!